THE Supreme Court yesterday confirmed the death sentence on a Binga man who axed his wife 11 times and chopped off her head before hiding it in a cardboard box following a domestic dispute. Wonder Munsaka (33) of Zenka Village under Chief Siabuwa was last year convicted of murder with actual intent by Bulawayo High Court Justice Nokuthula Moyo and sentenced to death by hanging. Munsaka axed his wife of 10 years, Fortunate Mutale (23) on the forehead, right palm and finger before chopping off the head in October 2014. Supreme Court judge Justice Antonia Guvava sitting with Justices Rita Makarau and Francis Bere on circuit in Bulawayo dismissed his appeal, saying the bench was satisfied that Justice Moyo could not be faulted for passing a death sentence given the circumstances under which the offence was committed. “The assault upon the deceased was vicious and protracted and the injuries were inflicted by the axe and directed at her head. The appellant struck the deceased no less than 11 times,” said Justice Guvava. She said Munsaka’s version of events was contradictory, an indication that he changed his story as the trial progressed Justice Guvava said Justice Moyo’s exercise of discretion to impose the death penalty in the circumstances could not be impugned since the murder was committed in aggravating circumstances. “The murder was committed in aggravating circumstances. Accordingly, we are of the unanimous decision that the appeal both against conviction and sentence lacks merit and it is hereby dismissed,” she ruled. Munsaka, through his lawyers Shenje and Company, conceded that the conviction was proper. He however, sought an order for a life imprisonment, arguing that the sentence imposed by the High Court induced a sense of shock. “Wherefore, the appellant seeks to impugn his sentence and pray that it be set aside and substituted with a sentence of life imprisonment,” said Munsaka’s lawyers. 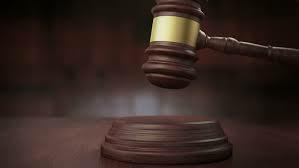 Chief Public Prosecutor Mrs Tariro Rosa Takuva, in her head of argument, said the death sentence was proper since the murder was committed under aggravating circumstances. “It is common cause that the murder was accompanied by mutilation when the appellant relentlessly struck the deceased with an axe to the point of decapitating her head. The murder was committed in aggravating circumstances and the death sentence is therefore appropriate in the circumstances,” she argued. According to State papers, on October 7 in 2014 at around 9PM, Munsaka and his wife had a domestic dispute at their matrimonial homestead. He got angry and struck his wife using an axe once on the forehead, right palm and finger and behind the right ear. Munsaka also struck her on the upper lip and nose. During the scuffle, Mutale bolted out of the kitchen screaming for help with her husband in hot pursuit. She fell down and Munsaka chopped off her head with the axe. He put the head in a large cardboard box and hid it under their bed. After committing the crime, he went to Nabusenga Dam where he washed his blood-stained clothes and the axe. Ms Agnes Mutale, a neighbour who heard the deceased screaming for help went to Munsaka’s grandmother, Ms Mavu Mwinde’s homestead and notified her. Ms Mwinde went to her grandson’s place and found the deceased’s body lying in a pool of blood in an open space in the yard and the head was missing. A report was made to the police who combed the house and found the head hidden under the bed. According to post mortem results, the cause of death was spinal cord injury, decapitation, chop wound and homicide. Munsaka took his two minor children to his parents’ home where he intended to leave them before he could proceed to Zambia. However, when he returned he found neighbours and the police officers gathered at his homestead. He tried to flee but was apprehended by the police officers. Prior to the trial, Munsaka in 2014 claimed that he was mentally unstable prompting the courts to send him to psychiatrists for examinations.